Note: all gameplay demos mentioned in this article are at the bottom of the section where they are mentioned. Upon realizing that E3 was this week, I figured that it was time to bring in an expert (Brian, my boyfriend) to foil my rookie reactions and celebrate upcoming titles. Here's to the first of many gaming collaborations. Cue the Little Green Men's "Ooh"
This is my first time writing for TFI, so I suppose I should introduce myself. I’m Brian. Uh. Hi, I guess. My girlfriend, Anna, has been slowly foraying into playing video games since we started dating. Don’t worry. This isn’t some sort of fear ridden article detailing her spiral into non-communication. She’s not addicted to anything like W.o.W.—thank God—and I actively support this newfound habit of hers. I picked up a controller for the first time at three years old. Mario Kart 64 was the first game I played (anyone who loved the NES era should feel geriatric… now). At twenty-two, and with four generations of consoles and an Art degree under my belt, I don’t think I’m being a braggart when I call myself a veteran of the field. I’ve been helping Anna through more modern games since she attained a system that doesn’t overheat when it renders water. So… for about seven months now. This is the first year of the three we’ve been dating that Anna’s had the tech capacity (a fancy-schmancy refurbished PS4 that she recently bought from Gamestop) to get excited about new games as much as I do. She’s recently been chasing writing about them for the website—and E3, the mighty vidja game Olympics—happened over the weekend. Add game snob boyfriend, late night writing, and shake: boom, instant start to an article series. So, without further slow and chunky exposition, I’m going to explain some of the many things that excited and bewildered me at E3 this year—from the perspective of a dude who’s actually forgone bathing to play the next mission (I was a shy teenager at the time). Kratos’ beard waves in the breeze (also, he may have kidnapped a small child). Those words also describe the (very tentative) looks of the game—which has done what few studios have been able to match until these days of steroid injected hardware. Cross the uncanny valley. In everything from the shifting of trees to the rustling of Kratos’ new bushy beard, there’s a thrilling undertone of life. Actual life. Not…polygon horse crap. That doesn’t surprise me. Graphics improve constantly—photorealism reaches new heights in the gaming industry all the time. Hell, some folks can render Skyrim on settings so high it literally ignites computers. No, what bewildered me was the presence in the gameplay trailer of the little Viking boy that Kratos seems to be instructing. The boy who refers to Kratos, nonchalantly, as father. Those not familiar with God of War may not know the tragic story behind Kratos’ pale complexion. To keep it short, an Oracle once cursed him by binding the ashes of his dead family to his skin. The things we see him do in the trailer…are strange. His character in every other installment of the series has been incredibly vengeance driven. There’s a small tidbit that I noticed watching the demo for the second time. 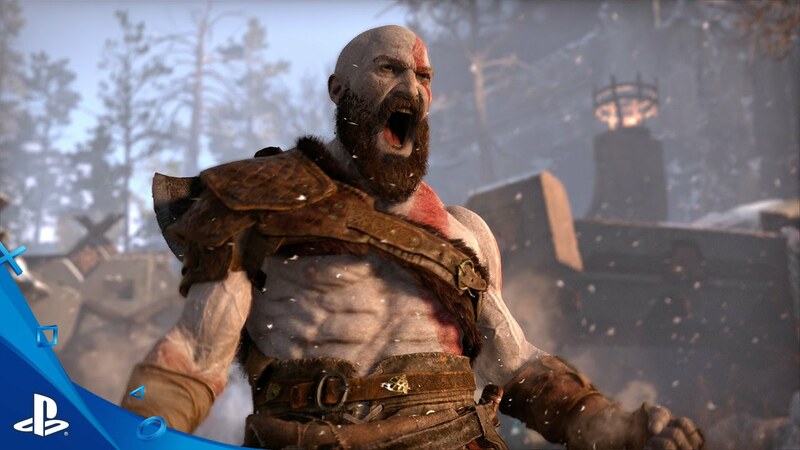 When Kratos is first hunting with this as-of-yet-unnamed child, we see the child make a mistake, angering a man, who is, in his universe, literally the god of violence. To keep my details and article length to a minimum, we (the E3 viewers) watched the god of violent, blood-streaming, muscle-rending, death do the unthinkable. The boy makes looses an arrow from the string without his father’s say-so, and Kratos takes a deep breath, explaining in his own terse way that mistakes happen—that they’re nothing to be sorry for, and you should aim to better yourself by them. “Do not be sorry. Be better,” is probably going to be my mantra from now on. Horizon Zero Dawn has some stellar looking gameplay (and it’s full of skin stealing C3POs). Horizon—which I will call it until I die—surprised me last year. This year, with a longer gameplay trailer and a short look at the crafting system, I can say that it appears to be coming along nicely. Many of you that follow gaming circuits will know that Horizon recently got delayed. I have my theories. Mainly from watching the character models move like robots powered on marionette strings. Game creation is hard, detailed work, and I wouldn’t bother mentioning a game I didn’t think had potential. Even if this small quirk isn’t addressed, Horizon’s environmental art, character design, and wildlife design make it a triple-A release worth following, so I suggest that you folks do it. Waiting for Dishonored 2 may literally cause me to have a stroke. Arkane’s masterpiece, Dishonored came out the year I graduated high-school. At the time, I was a terse, angry, straight-forward young man. So the open-ended, multi-path stealth simulator and I didn’t really click. I picked the game up again around two years back. My girlfriend and I had been dating for a few months, life was good, my patience with the world was improving. I fell in love twice that year. Dishonored quickly became my favorite game. Something about the cat-and-mouse of it held allure. Say what you like; as a gamer I will always find more gratification in being the patient hunter than the explosive gunner. Always. Barring a few issues—mostly kinks caused by the fact that the game was a new I.P.—Dishonored was very nearly perfectly built. There are so many varying pathways that I’m still replaying it, four years later, and finding new ways to beat old missions. I beat Dishonored. And beat it. And beat it. And beat it. Time passed, and eventually, I was frothing at the mouth for a sequel. Last year, I was in the remote hills of southern Oregon when my wish was granted. 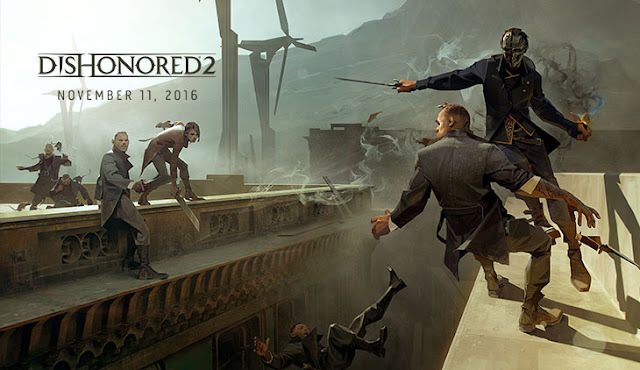 A cinematic trailer for Dishonored 2 was revealed. And then, dead radio silence for twelve months. This year, at E3, Arkane gave the first public demo of Dishonored 2, showcasing the new setting, the new graphics engine, and their new Femme-Fatale, Emily. At its core, Dishonored is a game about choice. Do I climb the roof and slip past the patrol or take everyone out? Do I lure the guards into a trap or engage them straight on in a one-on-seven fight? Do I kill my target or quietly eliminate them using non-lethal means? All these choices matter—they can make or break the ending of the game. And, with their new Gameplay demo, Arkane has shown that they’ve taken the time to really get things right. I have been waiting four years for this game. I’ve got but five months left until it’s released on November Eleventh. I pray I can hold out against excitement-induced brain-aneurysm for that long. As Brian mentioned previously, this is the first E3 that I'm really invested in. Although there are still two days left (Come on, Naughty Dog, come on, Irrational, I'm still holding out for a surprise), I'm thinking what I've seen so far is more than enough to keep me talking for a good long while. We Happy Few is set in what is described as an alternate version of 1964 England with a retro-futuristic feel. It was funded through a Kickstarter campaign and built using the Unreal Engine 4 (BioShock featured use of Unreal). Upon more research, I came to find that the populace of the game are all required to take a drug called Joy to help society collectively forget the Really Bad Thing (no, seriously, that's what it's called). Those who don't take their Joy are referred to as Downers. If someone is found to be a Downer the police and even random civilians will chase them down and force them to take Joy and again become a member of the blissfully unaware majority. You, the player, are one of these so-called Downers and are in a battle to escape this gilded nightmare. I read Brave New World as a Freshman in college and was fascinated at how it resembled aspects of our modern society. I'm interested to see how We Happy Few handles the more terrifying concepts as it seems like Joy is this game's equivalent of Soma, the cure all featured in Huxley's novel. Yet instead of in a distant future, this is set during what our world would know as the height of Beatlemania. I love retro-futuristic technology, so the fact that the story is set in 1964 thrills me. From the get go, WHF has put me in mind of BioShock. I see some of it as a glimpse of what Rapture may have been like before its fall, drug-numbed populace included (perhaps slightly less murderous). I'm interested to see if this game has some sort of morality twist as many others like it do. Will we have to make tough choices to survive, or will this game be more of a free runner and focus on stealth? The game is set to be released later this year but will be available in Xbox game preview and on Steam Early Access on July 26th (please release on PS4). Prey: More Dystopian weirdness, yay! A lot of promising stuff looks to be coming from Bethesda this season. But this title really caught my eye as it has a similar feel to a few games that I already adore. I typically don't want to go for games that look difficult from the get go, but this seems different. Originally envisioned as a sequel to the game Prey (2006), this game now seems to be a total reboot of 2k's effort. It focuses on the life of a human aboard a space station that is the subject of a series of experiments designed to improve the human race. Of course there's something that goes horribly wrong and suddenly there's a THING coming after you. After playing this, there is no doubt that I'll have some form of nightmares, but I'm definitely excited. After all, this is the studio that brought us Dishonored, and it appears to promise the same beautiful detail. Prey is set to be released sometime next year with more information coming at Bethesda's Quakecon. DLC, Dead Whales, and Remastered Editions, Oh My. I have no idea what's going on here. Neither does Norman. There are a lot of other games coming out that look intriguing or just plain good. One of the more intriguing titles is Death Stranding, some sort of horror game starring Norman Reedus and created by Hideo Kojima. I definitely feel like this is a middle finger at Konami after Silent Hills cancelled last year despite all the hype it received as a collab between Kojima and Guillermo Del Toro. That being said, I have absolutely no idea what this game is about: there's a beach, dead crabs, dead whales, weird oily hand prints, naked Reedus, and a disappearing baby. This is just strange enough that I'm going to keep on the lookout for more. Beyond new titles, some older favorites including last E3's darling Fallout 4 and the much beloved Skyrim are throwing us a bone this upcoming season. Fallout 4 is still releasing DLC including a new workshop, the ability to build your own vault and experiment on dwellers (like an in-game version of Fallout Shelter without the goal of being a good overseer), and Nukaworld: a Nuka Cola theme park. It looks like this game is going to continue being a hit for quite a long time, and I'm pretty happy about it. I didn't expect it at all, but Skyrim is being released remastered in October. It looks beautiful and will continue to work with old mods (important to some, but not me). Just look at it for yourself! This game looks darn pretty, and I am excited to revisit all the dragons and redeem myself from the "Prisoner" incident. What titles are you looking forward to? What do you wish had been announced at E3 this year? Brian is an idiot with a small capability for rumination and a dash of aesthetic knowledge. 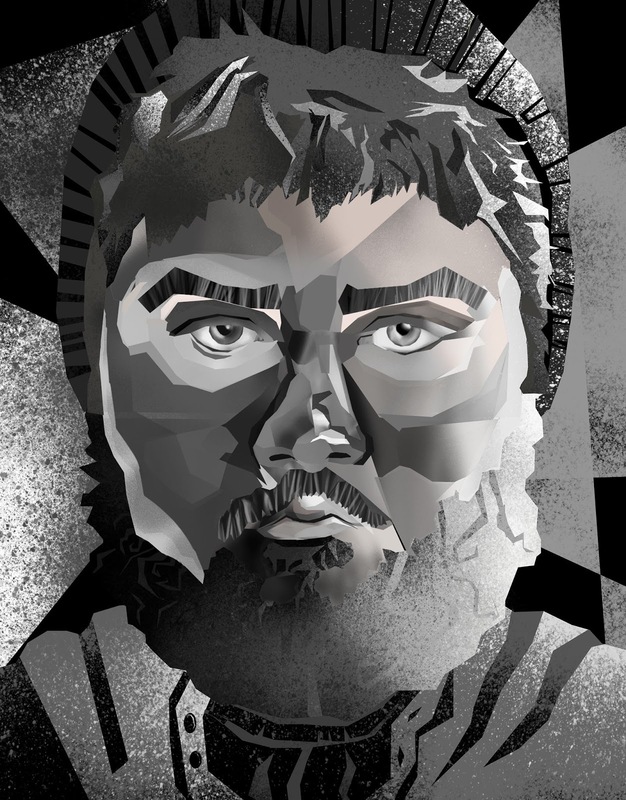 He’s been writing poorly since the age of seven, and has started multiple video game scripts and S/F novels. His hobbies include gaming, biking, and drawing. He is currently trying to punch his computer into telling him its secrets (pursuing a Comp Sci. degree at Kent State University). If you want to get in contact with him, he recommends messaging his girlfriend, Anna Gensimore--she’s… really the better half at that.